Vive Grande is a 53’ Samson C-Breeze Ketch, unique in her large flat deck and open space throughout. Designed for blue water cruising the heavy displacement of the boat makes for a steady ride as she cuts through even the harshest wind and waves. The perfect vessel for a family day sail or a weekend adventure. "Live Large!" is the theme. 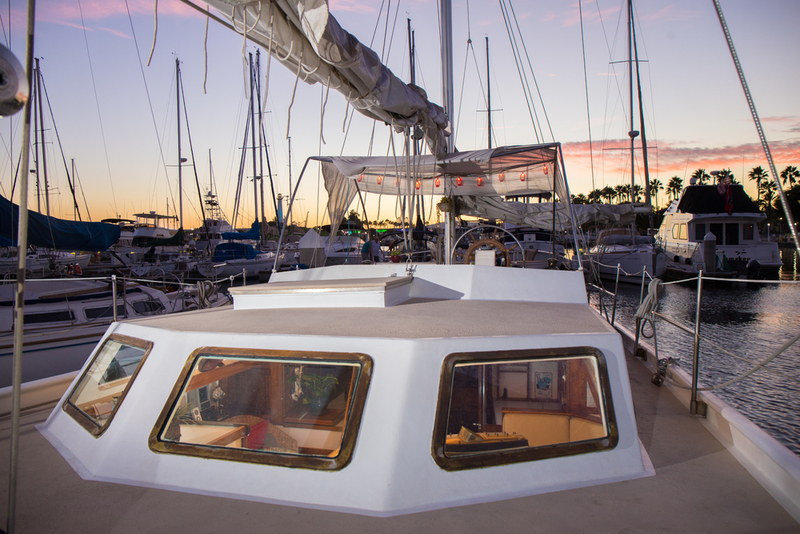 Come enjoy the beautiful and unique Vive Grande for a day sail or a long weekend at Catalina Island. Perfect for families, work parties, birthday parties we you are welcome to bring your own food and drinks or have everything catered from one of the excellent local restaurants. There are over 20 miles of shoreline to cruise and several wonderful anchorages to stop for a swim, soak up some rays or BBQ some freshly caught fish. The focus is on fun in a safe environment and the boat is certified with safety equipment exceeding US Coast Guard requirements. It is your choice whether to stay in the calm and protected waters of the harbor, where the water is like a lake and seasickness is very unlikely. Or head out into the deep Pacific Ocean for a little adventure. The shaded cockpit makes a comfy place to relax and enjoy a cold refreshment at the dock or while underway. The cockpit is in the center of the boat, making it the most steady and safe place to be while underway. However the rest of the boat is a large flat deck to relax, soak up some rays, fish, or enjoy a meal. The aft deck is the perfect place to enjoy a meal or a drink and enjoy the sunset in the beautiful Rainbow Harbor or a nearby anchorage. Deck Storage for SUP;s, Kayaks, ect. The main salon is spacious and beautifully decorated. A beautiful view off the stern at our dock. To starboard in the main salon there is more seating, instrumentation and a bluetooth stereo stereo. The V- Berth at the front of the boat has a queen sized bed below and a large bunk up top. The Galley has lots of storage, double sink, 4 burner stove and oven, mini-fridge, and amenities.